It has been quite some time since I last wrote through my blog and the reason is not being able to find enough time to put into it. I finally got some time today and thought to put some of it writing about HTTP. HTTP is the protocol that every web developer should know as it powers the whole web and knowing it is definitely going to help you develop better applications. In this article, I am going to be discussing what HTTP is, how it came to be, where it is today and how did we get here. First things first, what is HTTP? HTTP is the TCP/IP based application layer communication protocol which standardizes how the client and server communicate with each other. It defines how the content is requested and transmitted across the internet. By application layer protocol, I mean it’s just an abstraction layer that standardizes how the hosts (clients and servers) communicate and itself it depends upon TCP/IP to get request and response between the client and server. By default TCP port 80 is used but other ports can be used as well. HTTPS, however, uses port 443. As you can see, the protocol really had nothing more than being a stepping stone for what was to come. In 1996, the next version of HTTP i.e. HTTP/1.0 evolved that vastly improved over the original version. Unlike HTTP/0.9 which was only designed for HTML response, HTTP/1.0 could now deal with other response formats i.e. images, video files, plain text or any other content type as well. It added more methods (i.e. POST and HEAD), request/response formats got changed, HTTP headers got added to both the request and responses, status codes were added to identify the response, character set support was introduced, multi-part types, authorization, caching, content encoding and more was included. As you can see, alongside the request, client has also sent it’s personal information, required response type etc. While in HTTP/0.9 client could never send such information because there were no headers. In the very beginning of the response there is HTTP/1.0 (HTTP followed by the version number), then there is the status code 200 followed by the reason phrase (or description of the status code, if you will). In this newer version, request and response headers were still kept as ASCII encoded, but the response body could have been of any type i.e. image, video, HTML, plain text or any other content type. So, now that server could send any content type to the client; not so long after the introduction, the term “Hyper Text” in HTTP became misnomer. HMTP or Hypermedia transfer protocol might have made more sense but, I guess, we are stuck with the name for life. 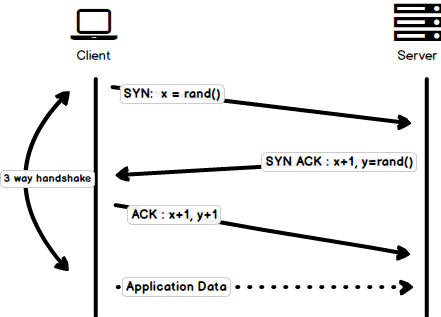 Three-way handshake in it’s simples form is that all the TCP connections begin with a three-way handshake in which the client and the server share a series of packets before starting to share the application data. SYN - Client picks up a random number, let’s say x, and sends it to the server. Once the three-way handshake is completed, the data sharing between the client and server may begin. It should be noted that the client may start sending the application data as soon as it dispatches the last ACK packet but the server will still have to wait for the ACK packet to be recieved in order to fulfill the request. However, some implementations of HTTP/1.0 tried to overcome this issue by introducing a new header called Connection: keep-alive which was meant to tell the server “Hey server, do not close this connection, I need it again”. But still, it wasn’t that widely supported and the problem still persisted. Apart from being connectionless, HTTP also is a stateless protocol i.e. server doesn’t maintain the information about the client and so each of the requests has to have the information necessary for the server to fulfill the request on it’s own without any association with any old requests. And so this adds fuel to the fire i.e. apart from the large number of connections that the client has to open, it also has to send some redundant data on the wire causing increased bandwidth usage. Hostname Identification In HTTP/1.0 Host header wasn’t required but HTTP/1.1 made it required. Persistent Connections As discussed above, in HTTP/1.0 there was only one request per connection and the connection was closed as soon as the request was fulfilled which resulted in accute performance hit and latency problems. HTTP/1.1 introduced the persistent connections i.e. connections weren’t closed by default and were kept open which allowed multiple sequential requests. To close the connections, the header Connection: close had to be available on the request. Clients usually send this header in the last request to safely close the connection. Pipelining It also introduced the support for pipelining, where the client could send multiple requests to the server without waiting for the response from server on the same connection and server had to send the response in the same sequence in which requests were received. But how does the client know that this is the point where first response download completes and the content for next response starts, you may ask! Well, to solve this, there must be Content-Length header present which clients can use to identify where the response ends and it can start waiting for the next response. It should be noted that in order to benefit from persistent connections or pipelining, Content-Length header must be available on the response, because this would let the client know when the transmission completes and it can send the next request (in normal sequential way of sending requests) or start waiting for the the next response (when pipelining is enabled). But there was still an issue with this approach. And that is, what if the data is dynamic and server cannot find the content length before hand? Well in that case, you really can’t benefit from persistent connections, could you?! In order to solve this HTTP/1.1 introduced chunked encoding. In such cases server may omit content-Length in favor of chunked encoding (more to it in a moment). However, if none of them are available, then the connection must be closed at the end of request. I am not going to dwell about all the HTTP/1.1 features in this post as it is a topic in itself and you can already find a lot about it. The one such document that I would recommend you to read is Key differences between HTTP/1.0 and HTTP/1.1 and here is the link to original RFC for the overachievers. Google went ahead and started experimenting with alternative protocols to make the web faster and improving web security while reducing the latency of web pages. In 2009, they announced SPDY. SPDY is a trademark of Google and isn’t an acronym. It was seen that if we keep increasing the bandwidth, the network performance increases in the beginning but a point comes when there is not much of a performance gain. But if you do the same with latency i.e. if we keep dropping the latency, there is a constant performance gain. This was the core idea for performance gain behind SPDY, decrease the latency to increase the network performance. For those who don’t know the difference, latency is the delay i.e. how long it takes for data to travel between the source and destination (measured in milliseconds) and bandwidth is the amount of data transfered per second (bits per second). The features of SPDY included, multiplexing, compression, prioritization, security etc. I am not going to get into the details of SPDY, as you will get the idea when we get into the nitty gritty of HTTP/2 in the next section as I said HTTP/2 is mostly inspired from SPDY. SPDY didn’t really try to replace HTTP; it was a translation layer over HTTP which existed at the application layer and modified the request before sending it over to the wire. It started to become a defacto standards and majority of browsers started implementing it. In 2015, at Google, they didn’t want to have two competing standards and so they decided to merge it into HTTP while giving birth to HTTP/2 and deprecating SPDY. HTTP messages are now composed of one or more frames. There is a HEADERS frame for the meta data and DATA frame for the payload and there exist several other types of frames (HEADERS, DATA, RST_STREAM, SETTINGS, PRIORITY etc) that you can check through the HTTP/2 specs. Every HTTP/2 request and response is given a unique stream ID and it is divided into frames. Frames are nothing but binary pieces of data. A collection of frames is called a Stream. Each frame has a stream id that identifies the stream to which it belongs and each frame has a common header. Also, apart from stream ID being unique, it is worth mentioning that, any request initiated by client uses odd numbers and the response from server has even numbers stream IDs. Apart from the HEADERS and DATA, another frame type that I think worth mentioning here is RST_STREAM which is a special frame type that is used to abort some stream i.e. client may send this frame to let the server know that I don’t need this stream anymore. In HTTP/1.1 the only way to make the server stop sending the response to client was closing the connection which resulted in increased latency because a new connection had to be opened for any consecutive requests. While in HTTP/2, client can use RST_STREAM and stop receiving a specific stream while the connection will still be open and the other streams will still be in play. Since HTTP/2 is now a binary protocol and as I said above that it uses frames and streams for requests and responses, once a TCP connection is opened, all the streams are sent asynchronously through the same connection without opening any additional connections. And in turn, the server responds in the same asynchronous way i.e. the response has no order and the client uses the assigned stream id to identify the stream to which a specific packet belongs. This also solves the head-of-line blocking issue that existed in HTTP/1.x i.e. the client will not have to wait for the request that is taking time and other requests will still be getting processed. It was part of a separate RFC which was specifically aimed at optimizing the sent headers. The essence of it is that when we are constantly accessing the server from a same client there is alot of redundant data that we are sending in the headers over and over, and sometimes there might be cookies increasing the headers size which results in bandwidth usage and increased latency. To overcome this, HTTP/2 introduced header compression. Unlike request and response, headers are not compressed in gzip or compress etc formats but there is a different mechanism in place for header compression which is literal values are encoded using Huffman code and a headers table is maintained by the client and server and both the client and server omit any repetitive headers (e.g. user agent etc) in the subsequent requests and reference them using the headers table maintained by both. Server push is another tremendous feature of HTTP/2 where the server, knowing that the client is going to ask for a certain resource, can push it to the client without even client asking for it. For example, let’s say a browser loads a web page, it parses the whole page to find out the remote content that it has to load from the server and then sends consequent requests to the server to get that content. Server push allows the server to decrease the roundtrips by pushing the data that it knows that client is going to demand. How it is done is, server sends a special frame called PUSH_PROMISE notifying the client that, “Hey, I am about to send this resource to you! Do not ask me for it.” The PUSH_PROMISE frame is associated with the stream that caused the push to happen and it contains the promised stream ID i.e. the stream on which the server will send the resource to be pushed. A client can assign a priority to a stream by including the prioritization information in the HEADERS frame by which a stream is opened. At any other time, client can send a PRIORITY frame to change the priority of a stream. Without any priority information, server processes the requests asynchronously i.e. without any order. If there is priority assigned to a stream, then based on this prioritization information, server decides how much of the resources need to be given to process which request. There was extensive discussion on whether security (through TLS) should be made mandatory for HTTP/2 or not. In the end, it was decided not to make it mandatory. However, most vendors stated that they will only support HTTP/2 when it is used over TLS. So, although HTTP/2 doesn’t require encryption by specs but it has kind of become mandatory by default anyway. With that out of the way, HTTP/2 when implemented over TLS does impose some requirementsi.e. TLS version 1.2 or higher must be used, there must be a certain level of minimum keysizes, ephemeral keys are required etc. HTTP/2 is here and it has already surpassed SPDY in adaption which is gradually increasing. HTTP/2 has alot to offer in terms of performance gain and it is about time we should start using it. For anyone interested in further details here is the link to specs and a link demonstrating the performance benefits of HTTP/2. For any questions or comments, use the comments section below. Also, while reading, if you find any blatant lies; do point them out. And that about wraps it up. Until next time! stay tuned.